>Compatible with our vertical chambers, have to be assessed with other chambers. · 3 polyacrylamide gels (12%) ready for use. · 6 polyacrylamide gels (12%) ready for use. This experiment’s aim is to learn the gel electrophoresis SDS-polyacrylamide use to understand the structure, function and diversity of proteins. Your students will separate proteins from bacterial, plant, serum, and milk proteins alongside a standard protein marker. 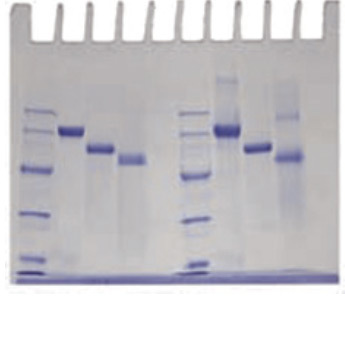 Denatured protein samples, standard protein markers, gel loading solution, buffer, and staining method. 3 polyacrylamide gels (12%), vertical gel electrophoresis apparatus, power supply, hot plate, white light visualization system, micropipette with fine tips, microtest tube holder, lab glassware, methanol, glacial acetic acid, and distilled water. Pre-stained proteins with unknown molecular weights are assigned molecular weights based on the relative mobility of prestained standard protein markers. 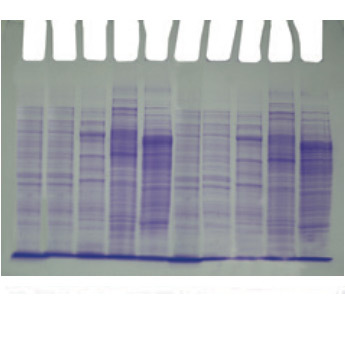 Denatured protein samples, standard protein markers, gel loading solution, buffer, and a staining method. This experiment’s aim is to develop the knowledge to prepare lysates of bacterial proteins from different species of bacteria and analyze their behavior by denaturing SDS vertical polyacrylamide electrophoresis to identify an unknown protein. Bacterial cultures and reagents, lipoproteins, lysozyme, buffers, staining method, unknown proteins samples, agar and nutrient broth. The Human Immunodeficiency Virus (HIV) causes Acquired Immuno Deficiency Syndrome (AIDS), a serious disease that suppresses a patient’s immune system which leaves them susceptible to infections. In this experiment, students Will use SDS-PAGE to simulate the identification of HIV proteins in simulated patient sample. The results of this test are used to diagnose an HIV infection. 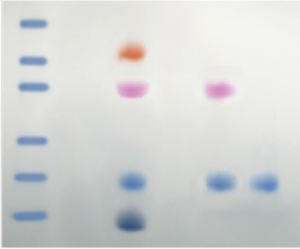 Denatured LyphoProtein™ samples, standard protein markers, practice gel loading solution, buffer, transfer pipets and Protein InstaStain®. 3 polyacrylamide gels (12%), vertical gel electrophoresis apparatus, power supply, hot plate, aluminum foil or foam waterbath float, white light visualization system, automatic micropipette with fine tips, microtest tube holder, lab glassware, methanol, glacial acetic acid, glass tray, plastic wrap and distilled water. In this experiment students will learn to purify partially green and blue fluorescent proteins. As an optional activity, students will determine the molecular weight of proteins by gel electrophoresis in denaturing polyacrylamide-SDS. 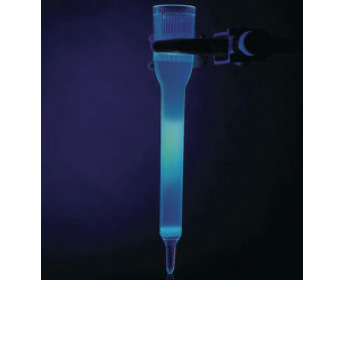 Columns and matrix, GFP and BFP extracts protein, buffers and reagents for electrophoresis. Waterbath, long wave UV lamp, ring stand, clamps, microtest tubes, micropipette and tips, vertical electrophoresis apparatus, power supply, hot plate, 3 polyacrylamide gels (12%). 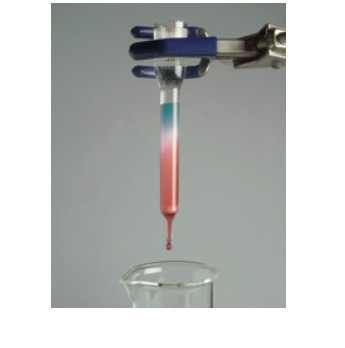 This experiment introduces chromatographic separation to your class and shows them how dyes of different colors separate on the basis of their size and shape. This experiment contains materials for dye separation which include dye sample, elution buffer and plastic disposables. Columns may be rinsed and reused. Sample mixture, chromatography columns, dry matrix, elution buffer, transfer pipettes, and microtest tubes. 50 or 100 ml beakers, 25 ml beaker or test tube, ring stands with clamps, and distilled water. 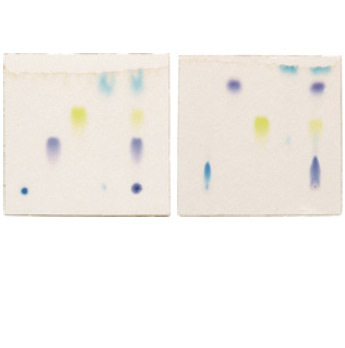 This experiment introduces chromatographic theory and methods of thin layer chromatography. A mixture of dyes is separated on a cellulose-based TLC plate using two different solvent systems. Samples, reagents and solvents, cellulose thin layer plate, and 5 µl glass capillary pipettes. 250 ml beakers, metric rulers, pipette pump, 5 or 10 ml pipettes, and distilled water. Ion exchanger, chemical mixture, potassium acetate buffer, and chromatography columns. Spectrophotometer, cuvettes, ring stands and clamps, test tubes, lab glassware, distilled water, and 5 ml pipettes and pumps. Bioprocessing is the production and isolation of desired products from living cells. 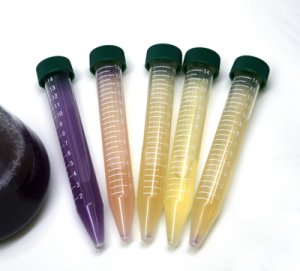 In this introduction to bioprocessing, students will use small-scale fermenters to produce chromogenic proteins using Escherichia coli. 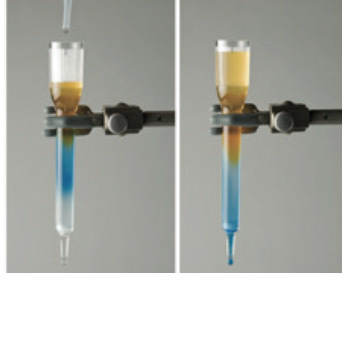 Protein extracts will then be separated using column chromatography toanalize the succes of the fermentation process. 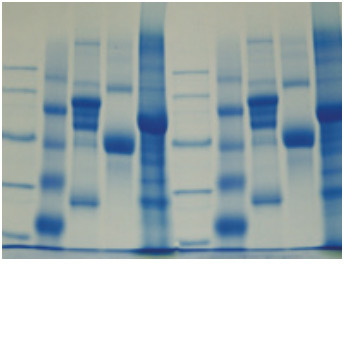 Finally, the protein solutions will be examined by SDS polyacrylamide gel electrophoresis to determine the purity of the chromogenic proteins. BactoBeads™ with purple and pink plasmid, LB growth media, ampicilin, IPTG, protein extration buffer, wash buffer, elution buffer, dry ion Exchange matrix, standard protein markers, 50% glicerol solution, protein denaturing solution, microcentrifuge tubes, pH paper, centrifuge tubes, chromatography columns, Protein InstaStain®, practice gel loading solution, tris-glycine-SDS electrophoresis buffer, transfer pipets and loops. Spectrophotometer and cuvettes, variable micropipet, centrifuge, vertical gel electrophoresis apparatus and power supply, waste container, stir plate and stir bars, thermometers, graduated cylinders, Erlenmeyer flasks, 70% etanol,ring stands and column clamps, aluminun foil, vortex, lab markers, waterbath, 3 polyacrylamide gels, glacial acetic acid, methanol, lab glassware, distilled water, air pump (optional), shaker incubator (optional) and autoclave or oven (optional).